1948 Prot Surf Ski, 11 ft 6"
DESIGNER: Harry McLean / Dr. J. S. Crakanthorp. 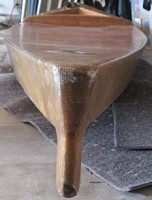 Hollow paddle board design of plywood panels fixed over a timber frame. Brass manufacturer's plate on nose. Metal bung plug at the tail. There is a laminated coat of fibreglass on the deck, probably post production. The front section is convex, and the rear concave. Nose ring for paddle leash. Metal plate: Specialist in small craft construction. 65 Parramatta Road, Five Dock, UA 2393. Information and images supplied via email by Murray Palmer, October 2007, with thanks. "Hi Geoff, I hope you are still around and decide to respond to this email. I’m an aussie living in San Diego, and recently acquired an old paddleboard/ski or whatever it is….made in Australia. The cool thing is it has a plate on it identifying the manufacturer. I’m trying to find out as much as I can about it. Any info or leads would be greatly appreciated. I’m told it dates from the early 1940s and is made of a type of wood no longer available. It is 11'6" by 28” wide, hollow plywood/screw construction with fiberglass coat. The front part of the deck is convex, and the back is concave. There is a metal bung at the rear. Researching Murray's enquiry, Mr. Wally Prott was contacted by phone at the family home in Hunter's Hill NSW in October and November 2007. W. F. "Wally" Prott started his marine centre, with the assistance of his father, in 1946 after returning home from World War Two. The business was located in rental premises at 65 Parramatta Road, Five Dock before the puchase a building at 8 Parramatta Road, Croydon. The company built a range of small recreational craft in timber and plywood including sailboats, dinghies, runabouts, surf skis, surfboards and waterskis and retailed water sports accessories, for example waterski ropes. Sailboat models included the enclosed deck, similiar to the surf ski design, VJ (Vaucluse Junior), VS (Vaucluse Senior) and the square nosed Moth, which was originally a Melbourne design that first appeared in Sydney in 1948. With intensive competition, these craft were continuously modified to reduce weight (at the cost of structual strength), eventually down to 90 lbs (kilos?) - able to be lifted by one man. Other sailboats included the 14 ft Northbrige Senior and the multi-purpose Heron. 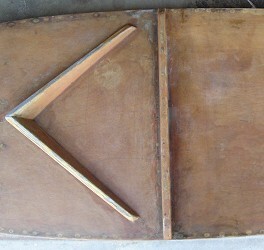 Plans for the European designs such as the Sabot and the OK Dinghy were metric and built with a close tolerance, requiring Wally to source metric rulers and tape-measures. The OK Dingy was the entry level boat for the Olympic Finn class. Sailboats were supplied to the customer as a complete package. Prot-Craft built the masts and spars, the sails were ordered to specification from established sailmakers and the rigging from a ship's chandlery supplier. Larger craft required a suitable boat trailer, usually requiring modification of size and support bracing to a basic design, also out-sourced. Smaller craft (VJs, Moths and surf skis) could be transported with roof racks. 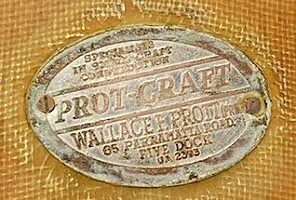 Prot-Craft canoes were built from 8 to 15 feet and, with a range of paddles, were retailed by the chain stores Nock'n Kirbys (George Street) and Anthony Hordens, Sydney. They were usually fitted with leather or canvas foot straps fixed with screws onto the deck. On occassion, rescue skis were ordered by South Sydney Junior Leagues Club for donation to Eastern surburbs surf life saving clubs. 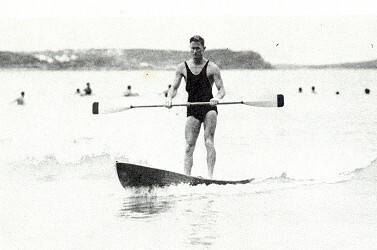 Prot-Craft Surf Ski, Five Dock, circa 1948. Photographs courtesy of Wally Prott Archives, with thanks. Some timber hollow surfboards were also manufactured and circa 1957 the company was supplied plans for the "new" Hawaiian surfboard, a shorter 9 to 10 feet design with a fin known in Australia as the Okinuee. 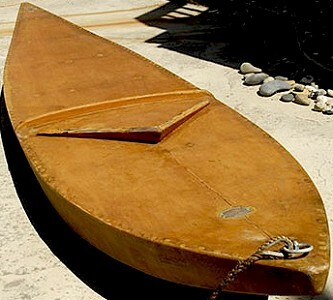 Around 1960, the company updated the surfboard design in balsa wood and fibreglass. Early Prot-Craft were identified by the screw-on metal plate, shown above. Wally Prott recalls the plate was originally coloured with enamel, a blue background and red flash (the raised face?) which appears to worn of the present example. These were followed by a short-lived die-cast script version, that were pressed into the timber with sharpe flanges mounted on the back. They proved unsatisfactory, often detaching from the craft after a short period of use. By the 1960s, smaller items such as canoes and paddles used a cheaper lightweight molded plastic screw on identification plate. Advertising material was generally in the marine section of Wednesday and Saturday editions of the Sydney Morning Herald, in preference to advertising in the current boating magazines of the day which was less productive. Customers of note included Jack "Gelignite" Murray who often stopped at Prott's marine centre to purchase watersking accessories on his way to Sackville on the upper reaches of the Hawkesbury River and "The Feather King", who arrived in a Bentley to purchase surf skis for use in Saigon. The comany ceased trading circa 1969-1970 as the recreational water craft market became dominated by fibreglass and alumimum designs. The premises were sold and then demolished to be converted to a car sales yard. Wally noted that several years ago, a James Strangelard (Strangeland ?) of Huntington Beach, California made enquiries of a surf ski similar to #328. Thanks to Wal Prott for his contribution. Critically, it is possible that early models used hollow timber construction prior to the widely promoted designs by American, Tom Blake, who patented his work in 1931 and published detailed plans and construction notes in Modern Mechanix magazine in 1933. See: A History of the Surf Ski. 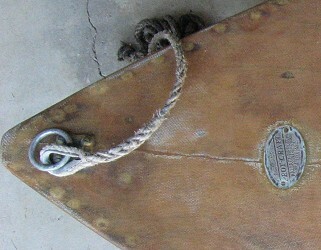 Nose ring, rope and manufacturer's plate. Splash guard and foot brace. The fibreglassed deck is definitely a post production addition. Geoff Cater (2007-2015) : 1948 Prott Surf Ski, 11ft 6''.